How Many Miles to 1,000? Suppose you are taking a trip. Your destination is 1,000 miles away. You're starting to get VERY bored in the car, so you decide to figure out how much farther you have to go. You ask your dad how far you've already gone, and he says you've just reached mile 632. How do you figure out how many miles are left of your trip? The kids then use whatever strategy they wish to solve the problem. 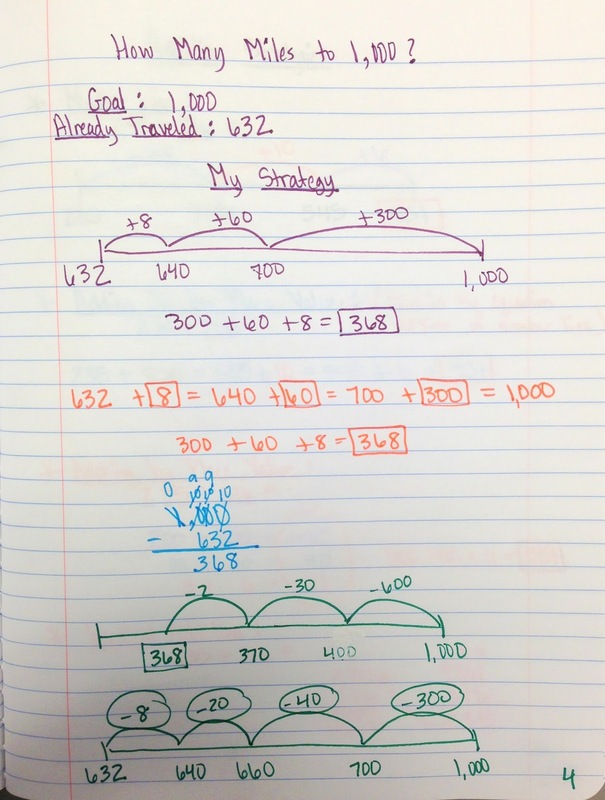 Just as with our addition lesson, the kids show their different strategies. There are always many different ones! These are just a few we saw in our room. 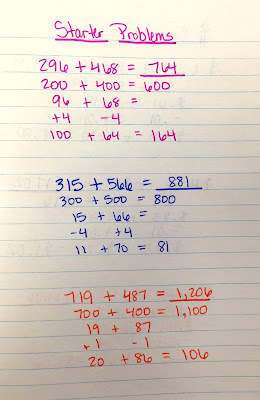 The most interesting thing is that even though this is technically a subtraction problem because we need to find the difference, most the kids turned the problem into an addition problem. They are so much more comfortable with addition! Most didn't even realize they had done this until we pointed it out in class. 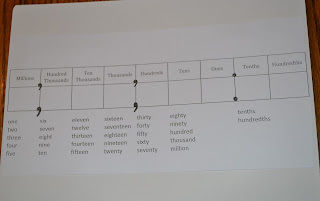 This activity will lead us into examining our different subtraction strategies tomorrow. 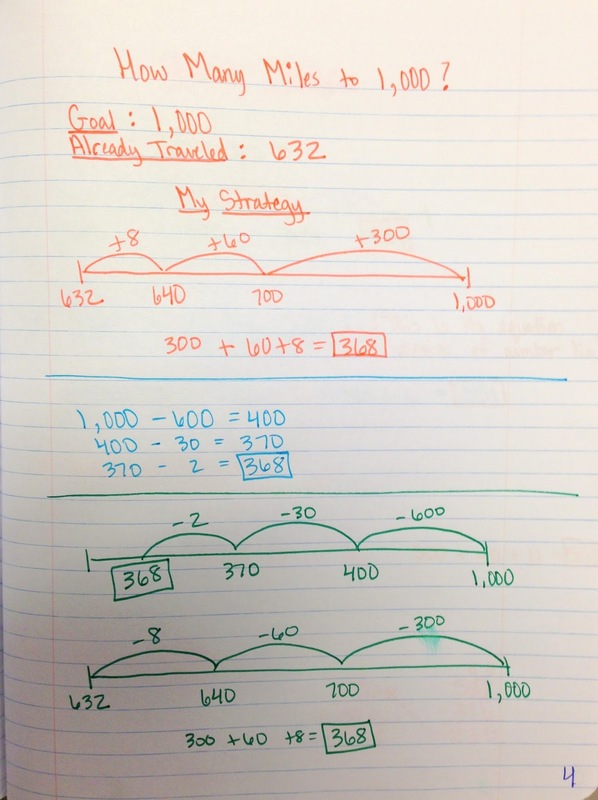 Wednesday we discussed ways to "start" addition problems. We began by just focusing on the largest place because the kids agreed that was the easiest to add first. Then we looked at what was left. 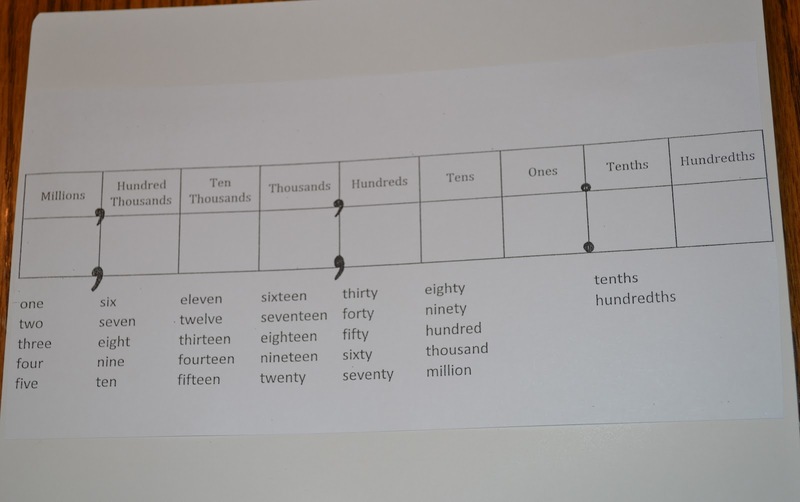 One of the kids suggested we move parts of the numbers from one number to the other. I, of course, questioned this idea. I find that my best lessons happen when I act like I have no idea what they're talking about! When I start questioning their thoughts, some kids will second-guess themselves. But this little guy held firm and insisted it would work. I was so proud of him! I made him prove it to me on the board, which he did, and the other kids felt comfortable backing him up after they'd seen proof. ;) We did several examples of this, then moved to doing this with money. 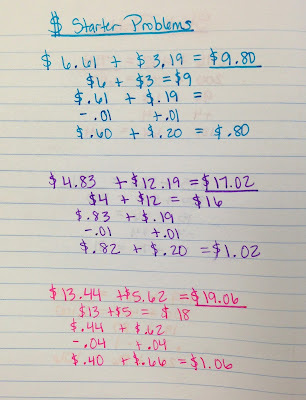 The kids haven't had much exposure to adding decimals of much size, so this way of thinking was very helpful for them! 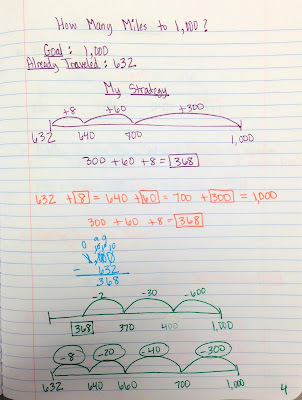 For me, the most important outcome of this lesson (and I mention it A LOT during the lesson) is that the children learn to think flexibly with their numbers. 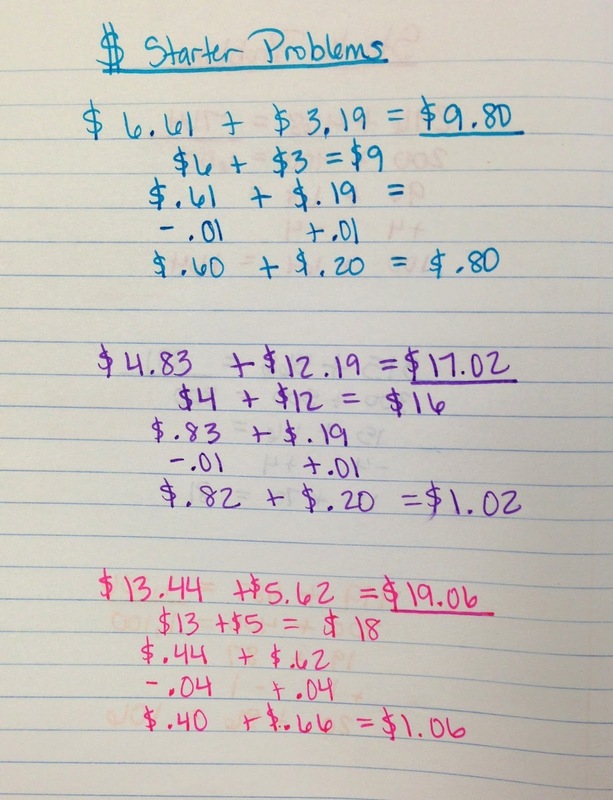 This is why I love math! In no other subject can you change up what you're given to make the outcome easier to figure out! The sooner we learn to think this way, the easier harder operations will become!! 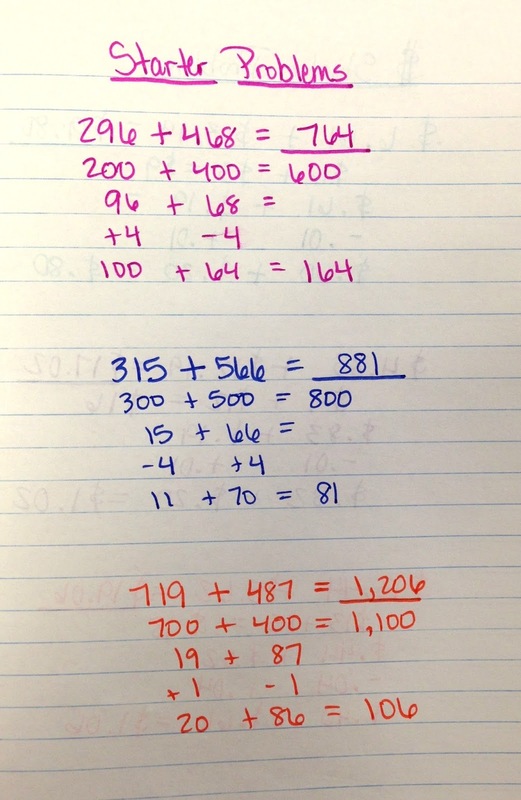 In the game Changing Places, students are to pick a 3-digit number. They then draw five cards. The cards all have an operation and number on them. For example, they may say +300, -40, +200, etc. From their five cards, they choose three to use in an equation. They begin with their starting number, then carry out the operations in their equation. The new total is their next beginning number. They repeat the process. 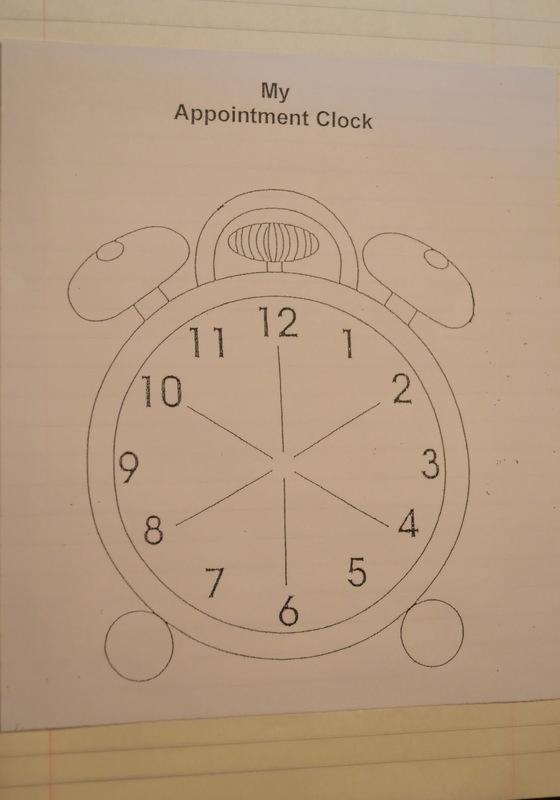 An example of clock buddies before partners are assigned. They just write the names of partners on the lines. Well, on Tuesday we set up our Math journals. We do TONS of work in our journals throughout the year, so it's important they be organized! Table of Contents is a must! I check the journals about every 3 weeks or so to make sure the dates/entries/page numbers are current. I find journals so helpful when the kids get stuck! They can always go back and help themselves by checking their notes. 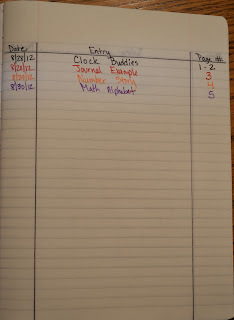 Journal entries are done together, and the rules (neat, complete, etc) are established the first day journaling begins. 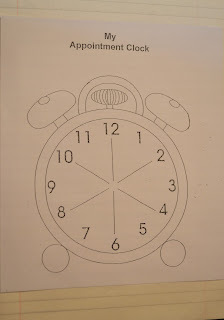 Also in the journal is four clocks to be used for clock buddies. I got this idea from a workshop presented by Nanci Smith. The idea is that you assign each student three clock buddies based on needs, and the students can pick the other three clock buddies themselves. There are four because the clock buddies are changed every quarter after you reevaluate your data and the students' needs change.The students pick their 2, 6, and 10 o'clock buddies, and I assign the students their 4, 8, and 12 o'clock If I wanted the students with someone specific, I would partner them up by saying, "Please partner-up with your 4 o'clock buddy." This is a great way to partner-up with purpose, without labeling your kiddos the Bluebirds, Redbirds, and Buzzards. Ha ha!